I've posted similar buns before, but this is not exactly the same. I've changed the dough for one that I like better, and these buns are absolutely divine. The almond filling keeps them from getting too dry, which is always a danger when baking with saffron, and the extra saffron in the filling gives a lot of flavor. Almond paste, which is common in my recipes, is a simple mixture of almonds and sugar, easily available in all grocery stores in Sweden. The ratio is usually 50/50, and it shouldn't contain anything else. Marzipan, in comparison, is sweeter. 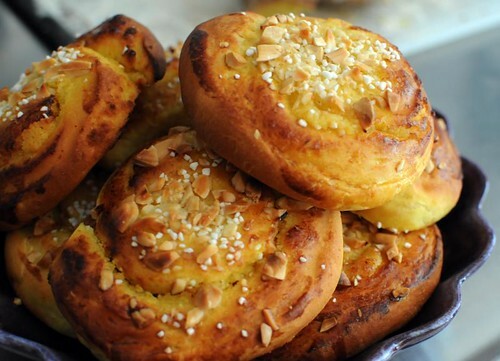 Tomorrow, I'll post a round-up of all my saffron buns, so you can bake some in time for Lucia, which is on December 13. Meanwhile, make the filling. Mix all the ingredients for the filling with hand-held electric beaters (or by hand, if you're vigorous) until it's smooth and even. Add a little extra syrup if it seems too hard to spread easily. Roll the dough into two large rectangles, and spread the filling on top. Roll from the long side, making sure you get it nice and tight. Cut into slices, about 1,5 cm thick. Place the buns on a lined baking sheet and leave to rise for 30-60 minutes. Brush with eggwash. Sprinkle with chopped almonds and pearl sugar, and bake at 200°C for 10-15 minutes.